Mysterious no more! 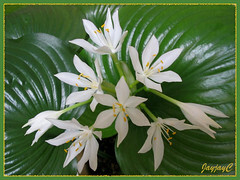 Our hosta look-alike plant has finally been correctly identified as a Cardwell Lily, no less beautiful than the Hostas! After 7 long years of growing them in our tropical garden, our potted plant bloomed for the first time ever last April. Absolutely captivating and had us mesmerized for more than a month with its staggered flowering. Common Name: Cardwell Lily, Northern Christmas Lily. Origin: Amboina Island (now Ambon) in Indonesia, hence the species epithet amboinensis. Also native to tropical regions of northern Australia and Southeast Asia, and naturalized in Malaysia and the Philippines. Features: Proiphys amboinensis is the most beautiful among the 4 species that make up the genus Proiphys. The other three species being P. alba with the smallest leaves, P. cunninghamii (Brisbane Lily) and P. infundibularis. A herbaceous perennial that grows naturally in the rainforest of Southeast Asia and Indonesia, and northern coastal regions of Australia, but now often seen grown in home gardens and elsewhere. It has a slow to moderate growth rate and offsets readily with clump-forming habit. It produces tunicated bulbs from which emerge attractive leaves held atop fairly erect petioles that usually bend with age. The green leaf stem grows between 20-75 cm tall, generally longer or almost twice as long as its leaf. The medium to dark green or lime-green foliage is absolutely beautiful. Cordate and broadly heart-shaped with a mucronate tip and slightly wavy margin, the large leaf blade is thin and papery. It has a shiny and glossy finish and distinctly furrowed with symmetrically curved venation with 12-15 vein pairs. 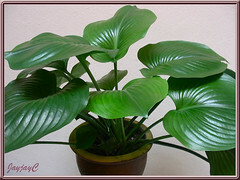 Leaf size is variable, up to 30 cm long and width may be almost the same or 2.54-5.1 cm broader or narrower than the length. The plant is evergreen in the tropics but in cooler regions, it undergoes a dormant period, becomes deciduous and dies back to an underground bulb during winter. Recalled reading an interesting article on its floral growth which stated that floral development was observed to have commenced from the bulb’s growing point as early as the dying-back of the leaves. Remarkable! Flowers are as fabulous too, though not often seen in our tropical country, Malaysia. (A friend of ours has planted them for 30 years and was never rewarded with flowers…wonder why?). They are known to usually flower around Christmas time (November to December) in the wild, hence the common name, Northern Christmas Lily. The 6-petaled striking white flowers are borne in a large cluster on a tall flowering scape up to 60 cm long or more, towering above the attractive foliage. A single umbellate inflorescence may have up to 24 flowers though usually lesser, with buds blooming in succession over an extended period of time. Each flower is about 5.5 cm across, perianth up to 7.6 cm long with its tube almost half of that and pedicel up to 4 cm long. The filaments with yellow stamens are fused at the base to form a central toothed cup, quite similar to that of the Hymenocallis caribaea (Caribbean Spiderlily). Its globular or pendulous flower head can be small or as large as 18 cm across, depending on the number of flowers in each cluster. Flowers will eventually set roundish fruits or seed pods that are smooth, glossy and dark green in color, 2.5-3 cm in diameter. These take months to ripen with seeds that can be germinated to produce new plants. The fleshy seeds in the fruit is also known to germinate prematurely whilst still on the plant, a process known as viviparous, and can be planted as new plants. Culture (Care): Proiphys amboinensis are hardy and easily grown, especially in tropical and sub-tropical regions. Light: Grows best in semi-shade or filtered sunlight but never in blazing sun that will scorch its foliage. Moisture: Medium water regularly, with soil being moist but not soggy. Soil: Prefers humus-enriched and well-drained soil. Others: Remove yellow or discolored leaves to keep tidy. Snip off the flowering scape when the flowers are spent if uninterested in getting them to set seeds. 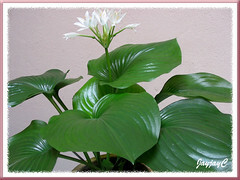 Feed monthly with a balanced houseplant fertilizer. Repot or replant when the clumps become overly pot bound or extremely large. Generally, disease and pest free. For subtropical and temperate regions: Hardiness: USDA Zone 10a-11. In frosted regions, plant them in pots in a greenhouse or conservatory. Plants will enter a dormancy period during winter and should be left undisturbed. Propagation: Propagate from seeds or division of bulbs, the latter being the easiest and more reliable method. Gently, dig out the clumps, remove the offsets that form on mature bulbs and grow them separately to get new plants. Update: Nov. 16 2009: refer here on how to propagate by seeds. Update: June 3 2013: refer here on how to propagate by division. 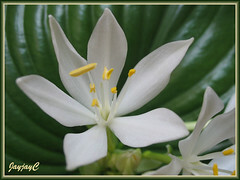 Usage: Cardwell Lily can be mass planted in garden beds or borders in shady areas under trees, or near water features. Excellent for container gardening, located outdoors in the shaded garden, patio, deck, porch or courtyard as a specimen or with a crowd of foliage plants. Surprise! Surprise! Our Cardwell Lily flowered again in two years! Blooming again during the Easter season… what a miracle! Amazing! Cardwell Lily bloomed again during the Easter season and again at two-year intervals! If it was not for the flowers, I would have thought that it was a hosta too.. I have seen this plant in few places, but never come across that it had flowers. Truly amazing that you have discovered it. Can i ask how often do you fertilize it? You’re very welcome, Harry! Yes, it amazed us too when it flowered for the first time…we were flabbergasted! It’s fertilized once monthly if we do remember. I have had flowering Cardwell or Brisbane lily well before 2002. They were magnificent as far as leaves were concerned , loved facing due N orth however when I split them up to give to friends they flowered magnificently. I gave a friend some , near me and they were neglected, they flowered beautifully. Am struggling at present but I will be getting some more bulbs from a friend that has them growing almost wild in her garden. I just love them to death, wish they were easier to procure. Wish you all the best in getting the bulbs soon and may they flourish and bloom well for you, Christina! Greetings from Penang – my mum has had what we now know is a Caldwell Lily in the garden for the longest time and it just bloomed a few days ago. 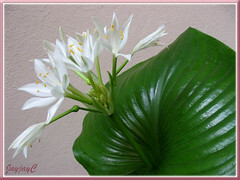 I had taken a few photos and was trying to find the name of the plant when I came across your image on Google. Thank you so much for posting and keep up the good work. Your garden looks lovely. God bless you! My mum is also retired and keeping a garden both with flowers as well as vegetables – we have from bougainvilea and tek-chia (red sugarcane) to kacang botol and cili padi. Would it be ok if she corresponds with you about plants? Greetings and God’s blessings to you too, Cecelia. Thanks for your encouragement and compliment. Great to know that you’ve nailed the ID of your plant via this site. Currently, I’m not in the best of health (as mentioned in my latest article) to be corresponding with your mum about plants. Instead, I’d suggest that she explores further our A-Z Plants Photo Gallery to select the plants that interest her and click on the thumbnails that will link to the related post containing plant profile, culture, etc. which may be helpful. Thanks for replying, Jacqueline – i hope you are in good spirits and faring well with your treatment and recovery. May God give you and your family new strength every morning. This link goes straight to my facebook page that shows some of the plants in our garden. Enjoy! Thanks for your well wishes and blessings, Cecelia. Praise and thank God that I’m recovering fine and coping well with the chemo sessions. You have a beautiful garden, thanks for the link. I’m truly impressed with your collection and enjoyed browsing through the lovely photos. Your mum’s gardening passion shines through the whole album. 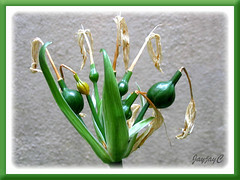 Would it be possible to purchase cardwell lily bulbs. Where from. It is such a gorgeous plant. Even it does not have any flowers, I’ll still say it is one of the most beautiful plants I have ever seen. Yes, I agree with you totally, Andrew! Thank you for dropping by. This bulb has never been a mystery to me but it has mystified me sometimes in its growing habits. Readily available in SEAsia I have always grown Proiphys amboinensis but not always been successful at it or flowering it consistently until recently and quite by mistake. What I’ve learnt is that light is key to flowering and in fact growing it successfully. The less light the more it struggles, in fact in very deep shade the bulbs almost disappear after one or two seasons. All the information I found said the exact opposite! When I first planted it I had roaring success under some semi deciduous trees, full morning sun and strong though dappled sun right through the day. The flowers were magnificent, standing some 60cm or so tall, the leaves were healthy and huge like the biggest hosta imaginable. I thought they had too much sun at planting and was expecting the worst. Then I planted some understory palms in the area which shaded them out permanently. I never got another flower and the leaves almost vanished. I got a bit bored with this state of affairs and decided to dig up the bulbs to see what was going on. I found they had become quite small and slender, tiny like a single slender daffodil bulb. Each year since the palms (Licuala ramsay) shaded them out they had thrown up just one or two weak leaves that easily fell over. I put all the bulbs I dug up into a large heap thinking I would throw them out, it was a sunny corner near the potting house. I covered lightly with top soil. I can never intentionally kill a plant. The bulbs much to my amazement flourished and multiplied in this state of complete neglect and hot direct full morning sun, and they also flowered their heads off, hardly any soil. Sooo I planted them all out again in full morning sun and whoosh thicker and more luxuriant than even a hosta. They flower every year on thick towering stalks just fractionally before the leaves arrive, bang on time for the rainy season. Bliss again. The bulbs are large and fat and squat now like clay cooking pots in shape, about five cm in diameter, they have lost that elongated banana look and long neck. The leaves are also much tougher and thick. So the secrete to growing them successfully I have found is light and lots and lots of it, including a good three or so hours direct sun. That was my mistake, they aren’t shade lovers per se but rather gluttons for as bright light as possible. They don’t even droop or wilt in full sun in fact but then they bleach a bit pale green which is quite attractive but I prefer the dark shiny green. On feeding, they seem to thrive on very poor soil but if you want some truly magnificent growth use manure and a good dose of potassium and plenty of water in the growing season to get the biggest bulbs and growth. Choose soil that is not clay or retains too much moisture, they like lots of water often but never waterlogged soil with no oxygen. They like a daily shower in fact much like they would get growing wild. If you over feed they throw up monster leaf stalks and leaves, the stalk about seven times as long and the leaf four times as broad as “Big Daddy” hosta with gigantic flower stalks and heads but they are then very very prone to wind and will flop extremely easily with just their own weight. So only for the most protected and brightest of spots if you want to grow them like this. I realise in fact that they like almost exactly what Cattleya orchids like, moisture, moisture, moisture, brightest light possible including a fair amount of fleeting direct sun, then they perform very well. The leaf colour helps you get this right. Slightly reducing the light alone will increase leaf stalk length and leaf diameter and depth of green but just too much and they flop over and they wont flower and go into decline, so its reaching a perfect balance thats key. Good luck hope this helps a bit. Hello Anton. Thank you so much for sharing your experiences on this spectacular plant. We’re sure many of us are grateful for all the info provided by you above. Thanks Jacueline, I love it when I find articles like this on this bulb. It seems such a neglected species in many ways and by everyone plant breeders and growers. Im quite astounded there isn’t at least one variegated form. This would be very easy to achieve I think at least with simple controlled gamma ray exposure. The most usual “mutants” arising from this common plant improvement technique is variegation in various forms and has been used to induce variegation in many many of our most common garden plants. I meant to add its a very popular plant in Thailand where I bought masses of these bulbs originaly. They grow them in full sun and they are huge the whole plant leaf and all about a meter high with emerging flower stalk even higher. In their case it’s the humidity thats key and almost zero wind. They have 80 – 90 – 100 % humidity in the wet season so full sun is not a problem. Im now keen to discover the other species which I’ve never seen. If you hadn’t mentioned them I wouldn’t have ever known, so a big thank you for that!